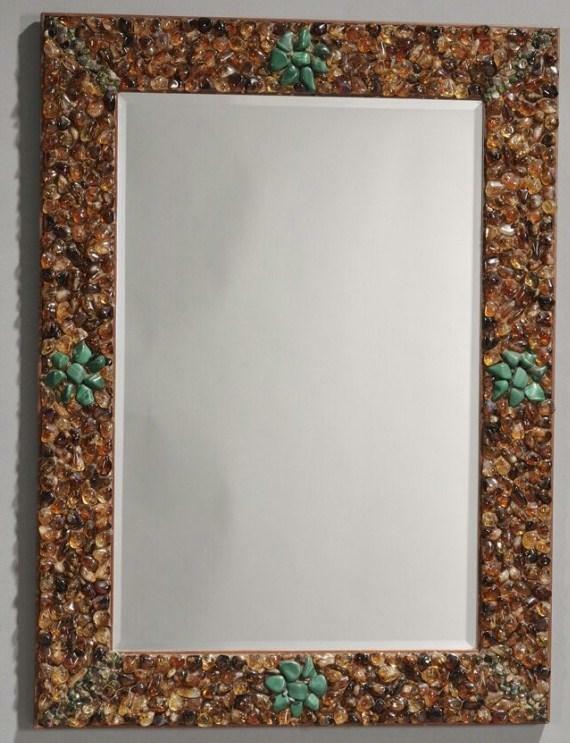 A Spectacular Jeweled Rectangular mirror mounted in mosaic frame predominantly comprised of Genuine Citrine, Malachite and Tourmaline Stones. This Piece was Originally Priced in the gallery at $18,000. Measurements: 30 1/2 x 22 1/4 in. 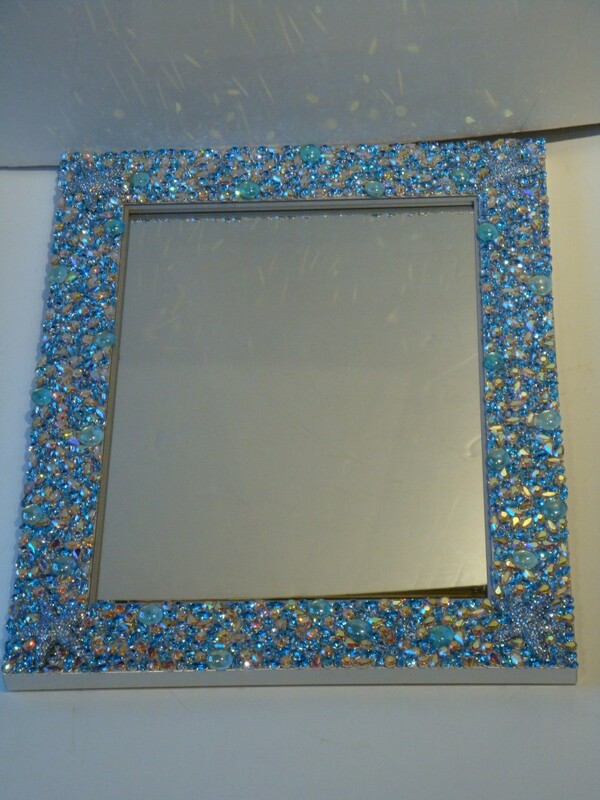 A Spectacular Large Limited Edition Metallic Painted Mirror with SWAROVSKI Crystals, Brooches, and Stones & Stained Glass from all over the World, Handmade by Designer Sonia Mizrahi. 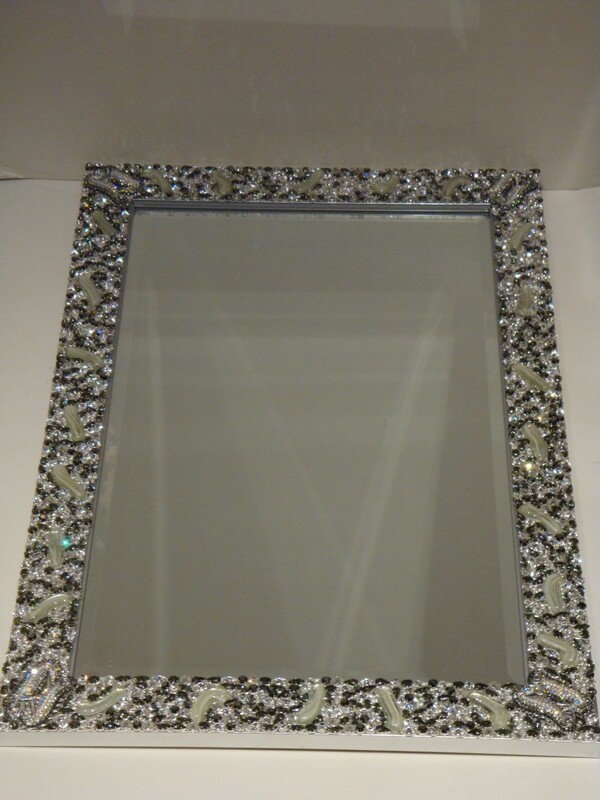 The Mirror is Beautifully adorned with many various Black and White "Diamond" Crystal and Iridescent Colored Swarovski stones and crystals as well as Exquisite Swarovski Starfish Brooches. Comes with Certified Appraisals. CAN BE HUNG VERTICALLY OR HORIZONTALLY!!! A Rare Limited Edition Masterpiece!!! A Spectacular Large Limited Edition Metallic Painted Mirror with SWAROVSKI Crystals, Brooches, and Stones & Stained Glass from all over the World, Handmade by Designer Sonia Mizrahi. 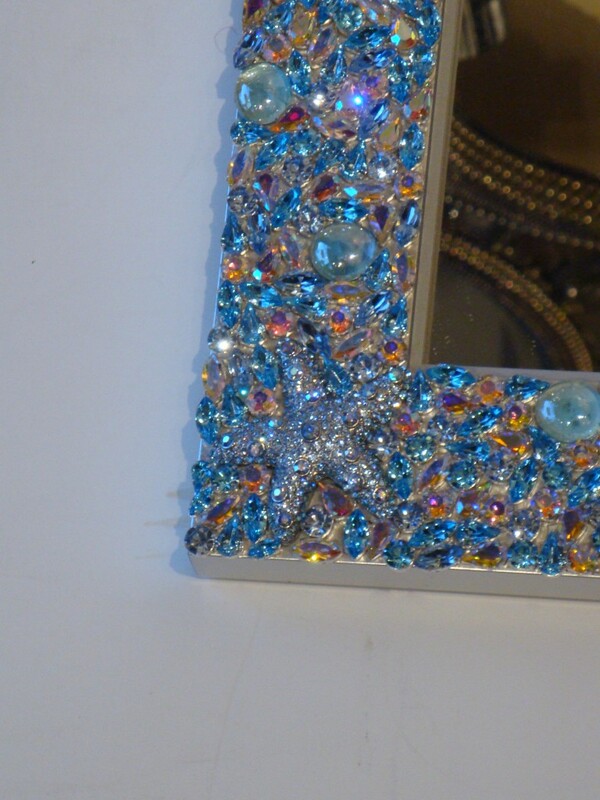 The Mirror is Beautifully adorned with many various Turqouise and Irridecesent Colored Swarovki stones and crystals as well as Exquisite Swarovski Starfish Brooches. This Piece Retails for $7500. Comes with Certified Appraisals. CAN BE HUNG VERTICALLY OR HORIZONTALLY!!! A Rare Limited Edition Masterpiece!!! 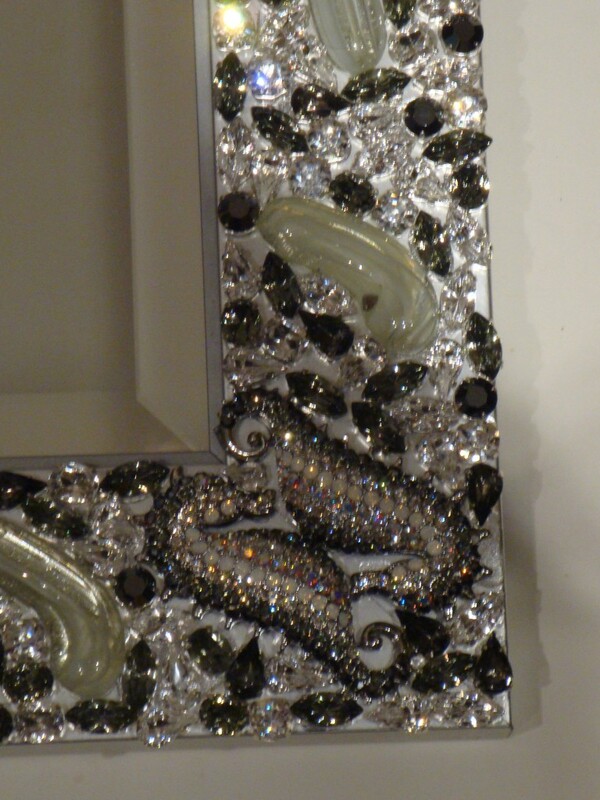 A Spectacular Large Metallic Painted Mirror with SWAROVSKI Crystals, Brooches, and Stones from all over the World, Handmade by Designer Sonia Mizrahi. 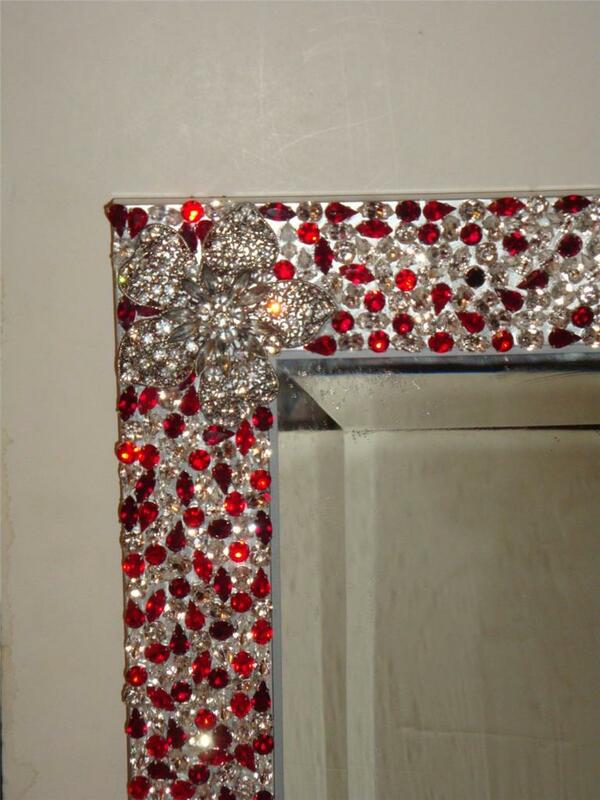 The Mirror is Beautifully adorned with many various CRYSTAL CLEAR & RUBY CRYSTALS as well as Exquisite Jeweled Swarovski Brooches. This Piece Retails for $12,000. Comes with Certified Appraisals. CAN BE HUNG VERTICALLY OR HORIZONTALLY!!! A Rare Limited Edition Masterpiece!!! 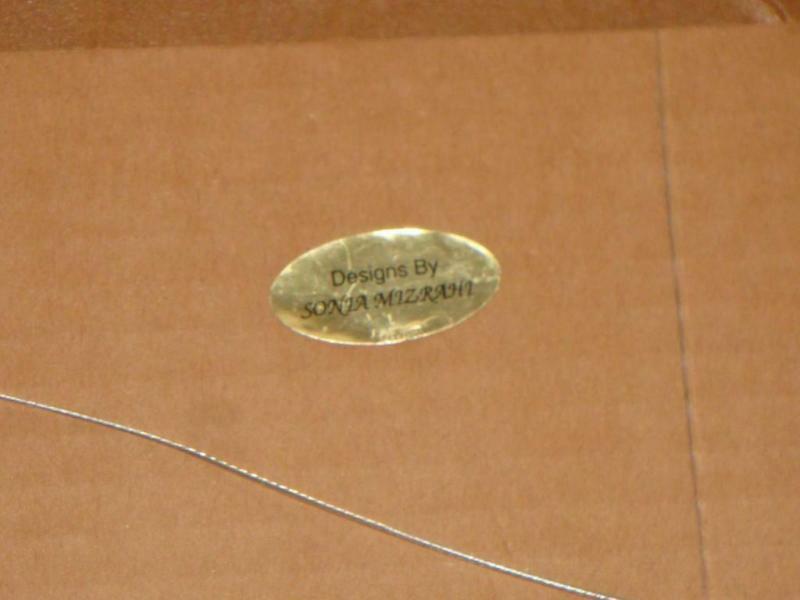 Being a New Yorker, Sonia Mizrahi's work has been Exclusively Represented in our gallery as well as being exhibited in a few other Exclusive Galleries in the Heart of New York City and in Red Bank, NJ. 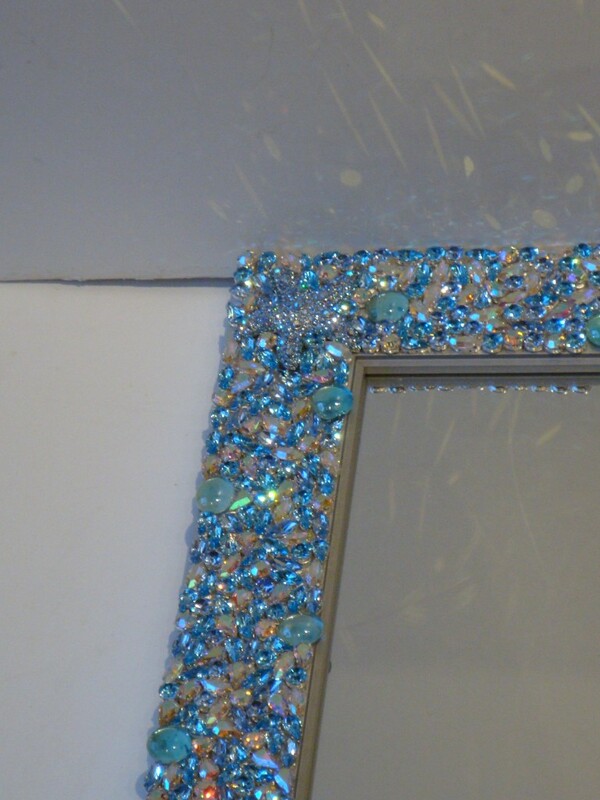 A Spectacular Large Limited Edition Metallic Painted Mirror with SWAROVSKI Crystals, Brooches, and Stones from all over the World, Handmade by Designer Sonia Mizrahi. 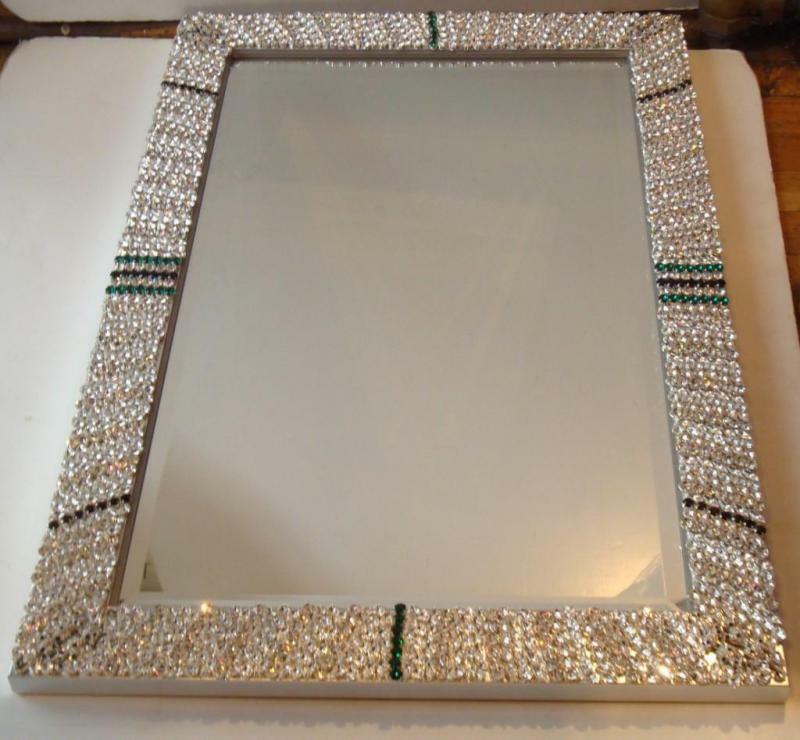 The Mirror is Beautifully adorned with many various CRYSTAL CLEAR & EMERALD CRYSTALS as well as Exquisite Swarovski TIGER BROOCHES INTERTWINED. This Piece Retails for $15,000. Comes with Certified Appraisals. CAN BE HUNG VERTICALLY OR HORIZONTALLY!!! A Rare Limited Edition Masterpiece!!! 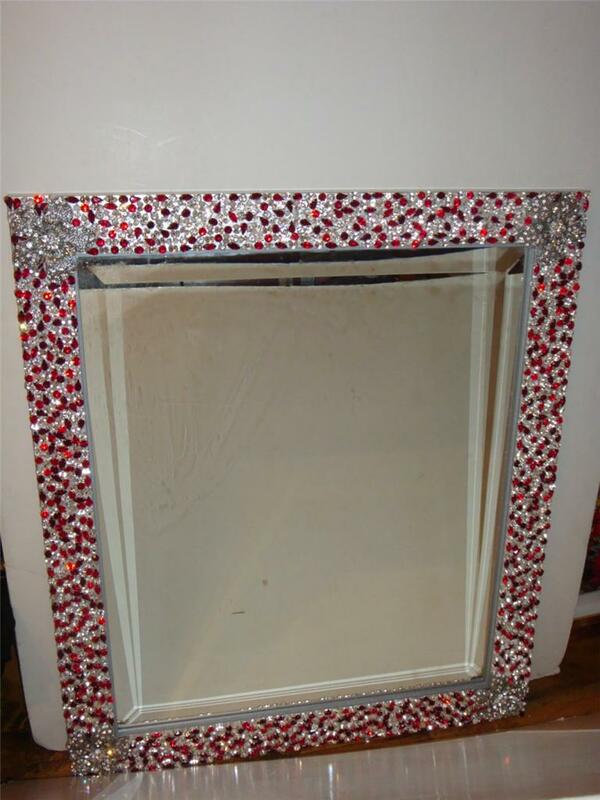 Measurements: 30" H x 20" WA Spectacular Large Limited Edition Metallic Painted Mirror with SWAROVSKI Crystals, Brooches, and Stones from all over the World, Handmade by Designer Sonia Mizrahi. 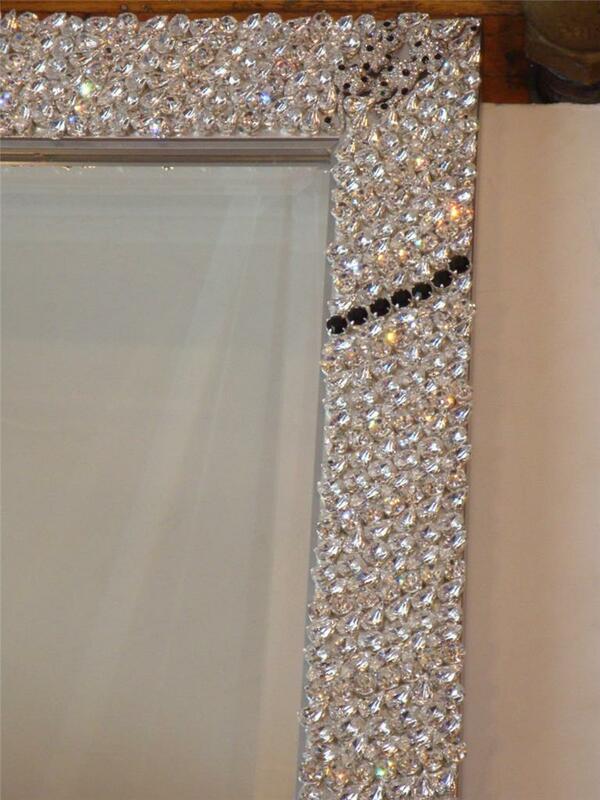 The Mirror is Beautifully adorned with many various CRYSTAL CLEAR & EMERALD CRYSTALS as well as Exquisite Swarovski TIGER BROOCHES INTERTWINED. This Piece Retails for $15,000. Comes with Certified Appraisals. CAN BE HUNG VERTICALLY OR HORIZONTALLY!!! A Rare Limited Edition Masterpiece!!! 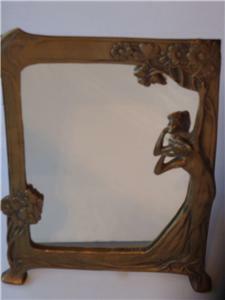 An Outstanding Art Deco Maiden Vanity Standing Mirror. Finely done with Impressive Bronze Detail of a Maiden Fixing her Hair. Taken out of an Upper East Side New York City Estate. Comes with Certified Appraisals!!! Copyright under Royale Galleries Inc. All rights reserved.